Did you know that more than 80% of modern Americans have leaky gut syndrome? And did you know that the content of your gut flora is directly related the microbiology of the soil where your food comes? Join OGS Special Guest Monica Corrado on Thursday evening for a FREE gathering to learn about the human microbiome, gut flora, soil flora, and the importance of these components in our overall health. Monica will discuss optimal nourishment, why we are so depleted, how to incorporate food preparation in your life, and why it all matters. This bonus lecture will provide context for Monica’s 2-day immersive workshop, Tending Your Inner Garden: Tools for Cultivating a Healthy Gut, at the 5th Annual Harvest Conference, Friday to Saturday, Sept. 7–8, 2018. 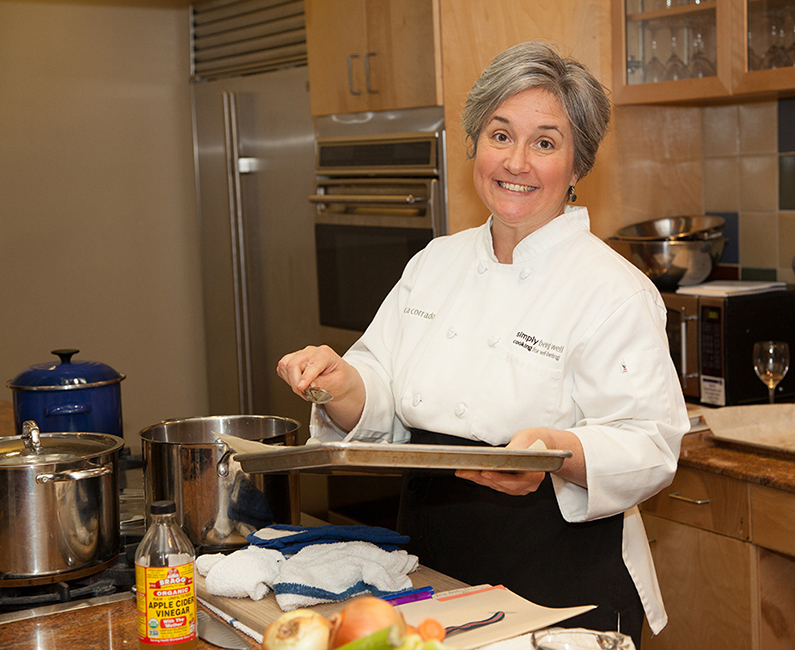 Monica Corrado, MA, CNC, CGP has many roles—dynamic teaching chef, speaker, author, Certified Nutrition Consultant, Certified GAPS® Practitioner, and member of the Honorary Board of the Weston A. Price Foundation for many years. Monica is passionate about illuminating the connection between food and well-being and lives to share the tools, knowledge, and inspiration to cook nourishing, traditional food. Monica has been teaching food as medicine throughout the United States for more than 12 years (after 18 years in sustainable food sourcing, preparation, menu design, and management). She started her own Cooking for Well-Being Teacher Training program in 2012 and has graduates all over the globe, including Mexico, Hong Kong, Canada, and the U.S.
Over the past 10 years, Monica’s work has focused on the gut-brain connection, and she is considered an authority on cooking to heal a leaky gut via the GAPS (Gut and Psychology Syndrome™) nutritional protocol. She is writing a four-part series called Cooking Techniques for the Gut and Psychology Syndrome™ Diet published by Selene River Press. The parts include meat stock and bone broth, culturing dairy, lacto-fermentation, and nuts and seeds. Monica has had tremendous results in her private practice with people living with autism spectrum disorder, ADHD, infertility, autoimmune disorders, and with people who are failing to thrive. Monica guides clients through the GAPS diet and helps them add nutrient-dense foods to their diet. Visit Monica’s website for more information about Monica, her books, charts, in-person and online classes, and her traditional foods Teacher Training program. I enjoyed Monica’s high-energy, down-to-earth teaching and techniques. Because of her passion and her clear, memorable explanations, I will be able to remember and pass on what I learned. Any resources invested in learning cooking with Monica is well worth it–whether changing your diet or assisting others. I would recommend this course to anyone! If you have any questions, please email Sera at farmer-programs@organicgrowersschool.org.